Raised in America. Cooked in China? Do American's have an appetite for chickens from China? We may soon find out. The U.S. Department of Agriculture on Thursday gave four Chinese companies approval to export cooked poultry products to the United States. But it's largely a symbolic move. That's because the only chickens that China can legally export to the United States must first be imported from countries that have USDA approved poultry standards. America, Canada and Chile are the only countries that make the grade. The USDA is still reviewing China's food safety system for processed poultry. In other words, Chinese companies would need to have chickens shipped in frozen from America, then cook them, refreeze them and send them back to...America. This is not an efficient way to do business. 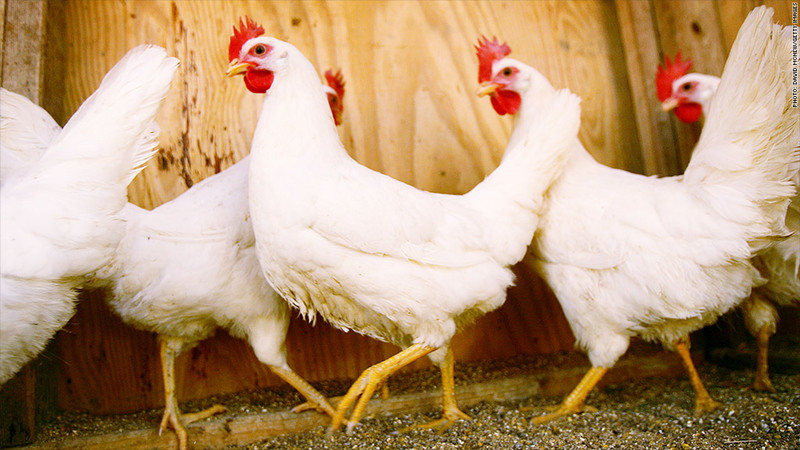 By most accounts, chicken producers have not found a way to make it economically viable. To date, no Chinese chicken product has been exported to the United States, according to spokesperson for the USDA's Food Safety and Inspection Service. Still, the move is seen as a victory for China's poultry industry, since it means that at least some of its processors are up to U.S. standards. The controversial decision follows several high-profile food safety scares in China this year, including a scandal involving poultry products sold by McDonald's (MCD), Yum Brands (YUM)-owned KFC and other Western fast-food chains. The country's poultry industry has also been rocked by periodic outbreaks of avian flu. "China's food safety system is a wreck," said Kate Fried of Food & Water Watch, a food safety advocacy group. The USDA's decision to green light imports of cooked chickens from China is "ill-conceived," and the agency is acting "in direct contradiction to what it promised it would do to protect U.S. consumers," she added.